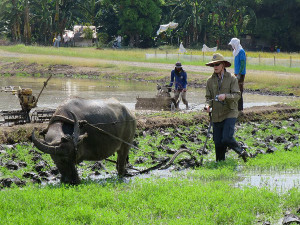 With Crawford Fund support, Aaron Preston, a PhD Student from Charles Sturt University, participated in the International Rice Research Institute’s (IRRI) “Rice Research to Production (RR2P)” course in May – June in the Philippines. 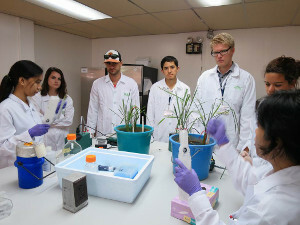 The RR2P is an broad course that covers all aspects of the rice cycle from production, research and evaluation, as well as a focus on developing the next generation of scientists and extension workers. “The course is an amazing opportunity for any young research student who is interested in rice development or international agricultural research,” said Aaron. The course gave students a range of experiences, from being knee deep in mud, levelling a rice paddy with a water buffalo, to visiting state of the art laboratories analysing the genetics of rice. 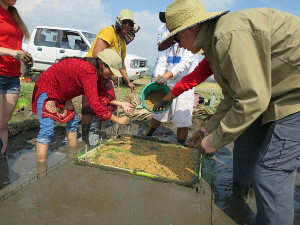 Participants saw firsthand the difficulties faced by subsistence rice farmers, which gave Aaron an appreciation of the challenges and importance of developing rice varieties to feed a rapidly growing world. “Through my interactions with other students I learnt about the difficulties and challenges they face within their countries in regards to agriculture. The interviews with farmers from Banawe and Nueva Ecija highlighted the challenges faced by subsistence farmers, as well as the importance and difficulties in agricultural extension,” Aaron said. The benefits of this training will extend beyond the duration of the course, especially as a result of the opportunity the course afforded the participants to establish professional networks. The Crawford Fund is sponsoring Aaron to attend the 2014 Crawford Annual Conference.